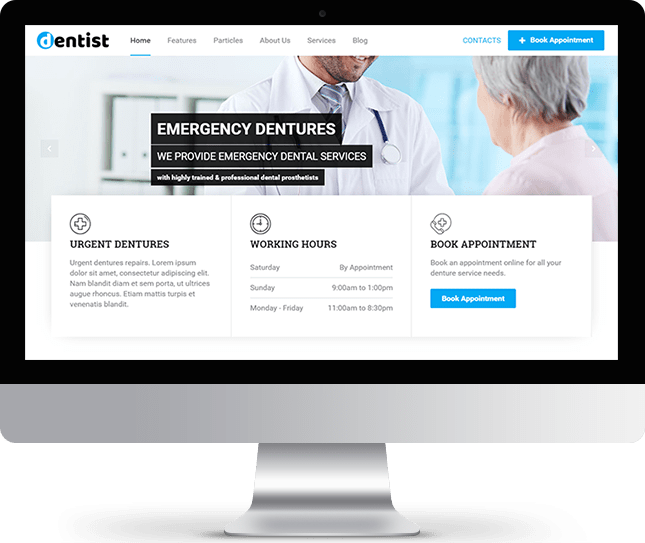 Dentist is a clean and professionally designed WordPress Theme for Doctors, Dental clinics or other Medical clinics. Using Dentist template, you could showcase your contact info beautify with Google map, receive call back requests with inbuilt Call back form, receive online appointment with inbuilt and fully customizable Ajax Appointment booking form with unlimited form fields, customized contact page with Ajax contact form, beautiful tabs and carousels to show clinic's services and Doctors from listing to details profile and much more. Read more about buying single item and joining club here. Create as many as module position you need with Drag and Drop Layout builder. No limitations on colors, No coding requires! set colors with inbuilt options as you need. Create unlimited custom page with drag & drop layout and particles. Customized blog page with WordPress default posts and Social Share options. All available particles are free with this theme. Easy to use particle to add full profile information without coding. Customizable Ajax contact form with unlimited form fields. Fully customizable and easy to use pricing tables. Show your portfolio with category, Ajax search, lightbox or modal contents. Go to demo and see incredible features and short codes under "Features" menu item.